The smart home market has great potential; however, adoption has been slow. Currently, only 10% of homes in the U.S., U.K., and Australia owns a connected home device. Despite the current numbers, analysts predict the market is set to skyrocket. By 2020, it is predicted that there will be 20.8 billion IoT devices with a market value of $1.7 trillion. Want to learn more about these staggering numbers? 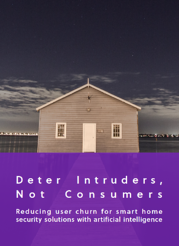 Download the Deter Intruders, Not Consumers smart home security brief today.